Applications for membership are closed. The internal organisation followed the guidelines set out in our Constitution, and our books were externally audited and presented to the Fair Trading office each year. The activities were carried out by a dedicated committee of volunteer members. 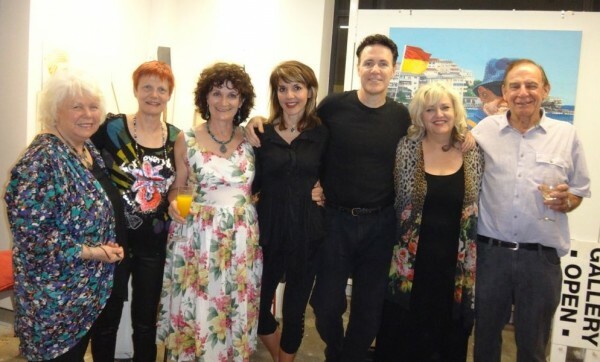 December 2014 – some of the committee and ex-committee members celebrate end of year at Sally’s studio – L-R-Judith Stevens, Sally Robinson,Janis Lander, Nafisa, Paul Newton, Robyn Ross, Alan Somerville. Social Membership offered Special Invitations to the Openings of exhibitions and events (such as dinners) run by Portrait Artists Australia. Access to portrait workshops run by leading portrait artists. Participation in the activities of a network of professional artists. Exhibiting Membership was open to SOCIAL MEMBERS ONLY. An annual membership fee was due at the beginning of each year. Entitlement to participate in Portrait Artists Australia exhibitions. Opportunities to participate in Portrait Artists Australia events, such as alla prima demonstrations for the public – drawing and painting from life. Representation on the Portrait Artists Australia Website, with a personal page for images and biographical information, updated regularly. Access to general information on artists’ taxation, legal, and contractual problems. Networking with portrait artists around Australia. Personal coverage in the Newsletters. An equal representation in any enquiries regarding PAA portrait commissions. A committee of experienced, professional artists, passionately devoted to promoting the art of Portraiture. Many of our artists have raised large sums of money for Charities through donations of their work for fundraising Art Auctions – the Sir David Martin Foundation, Humpty Foundation – RNS Hospital, Clown Doctors; The Humane Society; the “Genes for Jeans” Art Auction Campaign; The Northcott Society’s Beaux Arts Ball Charity Auction; The Fischer Road Special School; The Children’s Hospital Randwick; The Westmead Children’s Hospital. Nafisa Naomi continues to raise large sums for her charity “Animal Works” in support of endangered species. In 2003 the PAA Committee organised a Gala Black-Tie Dinner at the ArtHouse Hotel, Pitt St Sydney. This event co-ordinated by Nafisa Naomi and Robin Ross raised $50,000 in support of Legacy. PAA Artists Jan Williamson and Paul Newton each executed a portrait of a decorated war hero, which they donated for the event’s Auction. As a non-profit organisation, PAA hosted 1- 2 public exhibitions per year featuring the work of the members in accessible venues like the historic ArtHouse Hotel in Sydney (2003, 2004, 2005, 2006, 2007, 2008, 2009, 2010, 2012); NSW Parliament House, Sydney (2007, 2009, 2011, 2013); Federal Parliament House, Canberra (2009, 2012); the Supreme Court Building, Sydney (2006); The Victorian Art Society Galleries, Melbourne (2011, 2014); and the Australian Embassy, Washington DC (2005, 2014). The intention was to promote the art of portraiture in Australia and overseas, in a general context free from prize giving. Sponsorship – with logo representation and publicity on our website, newsletters and invitations catalogues; GOLD – $10,000 upwards; SILVER – $5,000 upwards; BRONZE – $2,000 upwards. A Donation, to be listed as a tax deduction, in support of a national group of hardworking and dynamic artists, a vital part of the Nation’s cultural capital. Even modest donations of $1,000 or $2,000 were very useful for advertising, publicity, mailouts, freight and towards opening night expenses. The artists at the opening of PAA 2005 exhibition at the Arthouse Hotel in Sydney – “Fur and Feathers”. 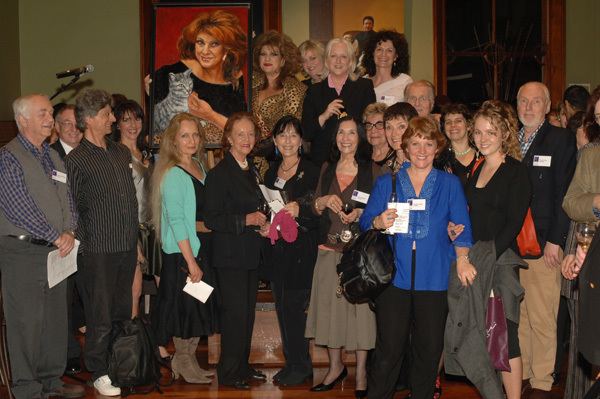 Back row – opening speaker Maria Venuti stands with her portrait by artist Nafisa Naomi,beside her are Robyn Ross, Sinead Davies, and Janis Lander. Front row – Maurice Schlesinger, Peter Smeeth, Nafisa Naomi, Constance Farquharson, Val Landa, Laura Hopkins, Eva Herz-Murray, Janet Johnson, Margot Gough, Samantha Tidbeck David Rees. You can continue to follow the artists’ activities on the PAA Facebook page.